Melanie Goergmaier is a PhD Candidate, as well as a Teaching and Research Assistant for the European Union Center at the University of Miami Department of International Studies. Her specializations are International Relations and International Political Economy with a focus on European Union Studies. She holds a Master’s Degree in Business Administration from Elon University in North Carolina as well as a Bachelor of Science Degree in Business Administration from Catawba College in North Carolina. Melanie Goergmaier was born and raised in Munich, Germany where she also graduated from high school. As a European Union citizen, she has participated in numerous EU global study abroad programs in France, Australia, Jamaica, Costa Rica, Chile, and Argentina. 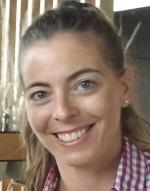 Ms. Goergmaier has experience working and teaching in higher education globally since 2001.